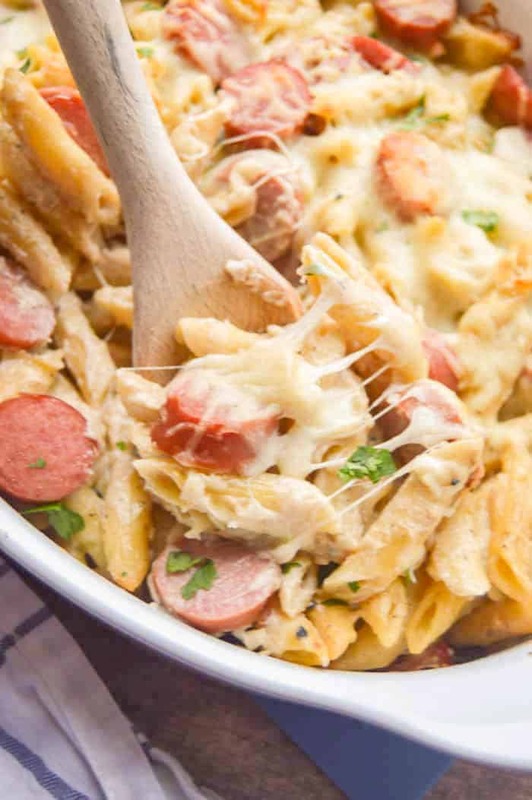 This Kielbasa Alfredo Bake is a family favorite that even the kids will enjoy! An easy recipe with a simple homemade Alfredo sauce and sliced kielbasa. 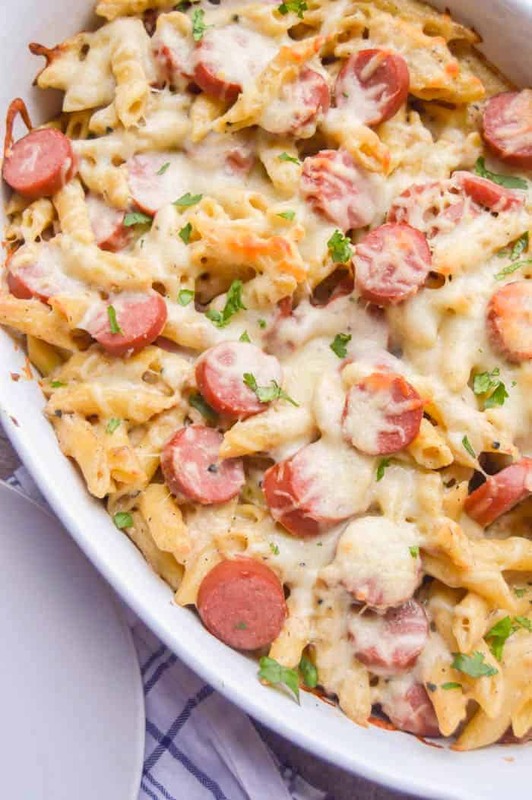 This easy Kielbasa Alfredo Bake is one of my favorite dishes to make my family! Mostly because there is no fighting with the kids to eat dinner, they love it! My oldest even had seconds. When feeding kids I really have to simplify what I call the dish. Since they don’t realize they like Alfredo or kielbasa I served this dish to them as cheesy noodles and hot dogs. Works overtime, it’s all in the wording! Have you ever done that before to get your kids to eat their food? A quesadilla is now a Mexican grilled cheese and chicken is just rust free chicken nuggets. Leave me a comment and tell me what dish you re-name so your kids will eat it! 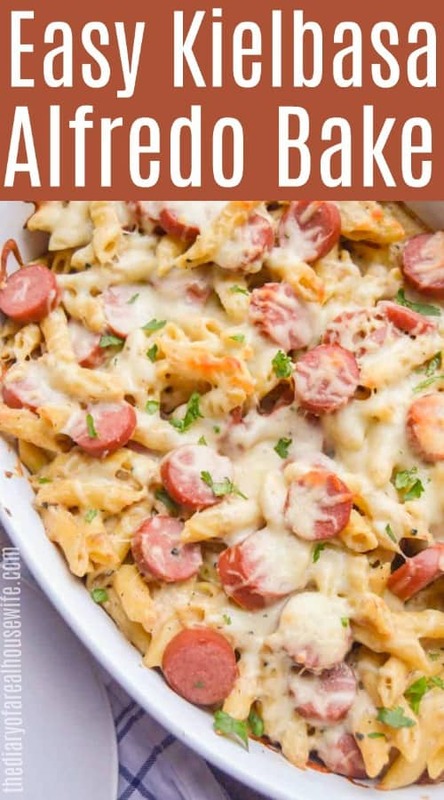 My husband and I we really enjoyed this Kielbasa Alfredo Bake and even had a few days leftovers that we continued to enjoy! Pasta always makes for good leftovers! Start by cooking your pasta. While that is cooking make your sauce. This is my favorite part butter and minced garlic in a large pan. I LOVE the smell of garlic and butter cooking, soooo good! Next, add flour and once it is well-combined flour in your chicken broth then half and half. Allow it to thicken then add in the cheese! I usually add small amounts at a time. Mix and let it melt while you stir. Keep doing this until your cheese is gone and your sauce is thick. If you toss it all in at once you could end up with a chunky sauce. This is why I love Alfredo sauce! It’s just a super creamy melted cheese sauce! Drain your cooked pasta and place it in a casserole dish. Pour your homemade Alfredo sauce over it and mix it up. Last slice up Kielbasa and put it in your casserole. Top with more cheese, yes more cheese then bake. Follow The Diary of a Real Housewife for even more yummy recipe ideas! Start by cooking your pasta according to package directions, drain, and set aside. In a large pot melt butter then add in minced garlic. Allow to cook for 1-2 minutes then whisk in flour. Whisk together until flour and butter are combined. Whisk in chicken broth and half and half. Add salt and pepper and whisk for 5 minutes until thickened. Add Parmesan and 1 cup mozzarella and stir until cheese is melted. Preheat your oven to 350 degrees F. Add cooked pasta to a casserole dish and pour over homemade warm Alfredo sauce and mix. Slice kielbasa and place it in the casserole dish. I mixed in half of mine and placed the rest on top. Top with remaining mozzarella cheese and sprinkle on parsley. Bake for 10-15 minutes or until cheese is melted and bubbly. Serve and enjoy! Hahaha!! I love the egg pie! Mine will catch on soon I am sure. My aunt would make tomato soup and grilled cheese. We thought we needed chicken in it to make it good. She called it ” chicken run thru soup” and we ate it and loved it. I’m sure she added chicken broth and hence the title. I love grilled cheese with my tomato soup, sounds yummy Cindy! I had to rename a few meals but not like you might think. My kids liked weird combinations. My one daughter hated oatmeal cookies but loved porridge cookies. My youngest would not eat creamsicle ice cream but couldn’t get enough mayonnaise and cheese whiz ice cream. She also would not eat green olives on a pizza but insisted on having frog eye balls on her pizza . Oh my now that is creative! I love that they would want to eat mayonnaise and cheese whiz ice cream! HAHA! My family loved this recipe. I had to add an extra tablespoon of flour which did not effect the taste but I think it was due to making my own half and half of heavy cream and milk. I did shred my own mozzerella cheese which came out clumpy in my food processer but again it did not effect the taste. I did add an extra package of Keilbasa as one was not enough with the pasta. Thank you so much for posting this recipe! So glad that you liked it Sally!! This recipe is one of my favorites! As children my sisters refused to eat meatloaf. My mother would divide and cook it in muffin tins and called them meatballs. They loved meatballs! Many years later mom planned to serve corned beef hash and cabbage to her grandsons. They balked so instead she served “cowboy hash” and “hot lettuce”. They loved it! I love that!! I actually just made meatloaf in a muffin tin and my kids loved it. I love how it’s all in the name for kids!